Push limits with this liquid liner that works wide-eyed wonders. Touch-ups are never necessary because no matter how much humidity you throw at it, this eyeliner does not budge and lasts for 17 hours or more. Its fully opaque coverage means that after just one swoop of the brush you’re ready to go. Whether you’re crafting a clean cat-eye or a foolproof flick, the SUGAR Eye Warned You So! Double Matte Eyeliner will get the job done. Double Matte = Double Impact. Non-stop Wear For 17+ hours. Zero transfer, flake or fade. The SUGAR Eye Warned You So! Double Matte Eyeliner is free from parabens & formaldehyde. This product is dermatologically and ophthalmologically tested & approved and 100% safe for your skin. Currently available in the shade "01 Black Swan". Explore the entire range of Eyeliner available on Nykaa. 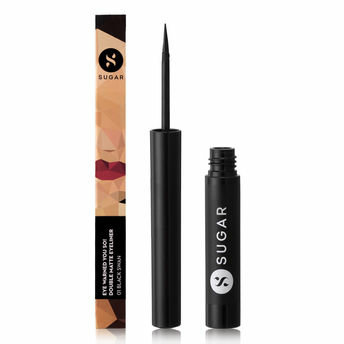 Shop more SUGAR products here.You can browse through the complete world of SUGAR Eyeliner .